Heart strings, meet purse strings. Who says investment decisions can't be both smart and compassionate? 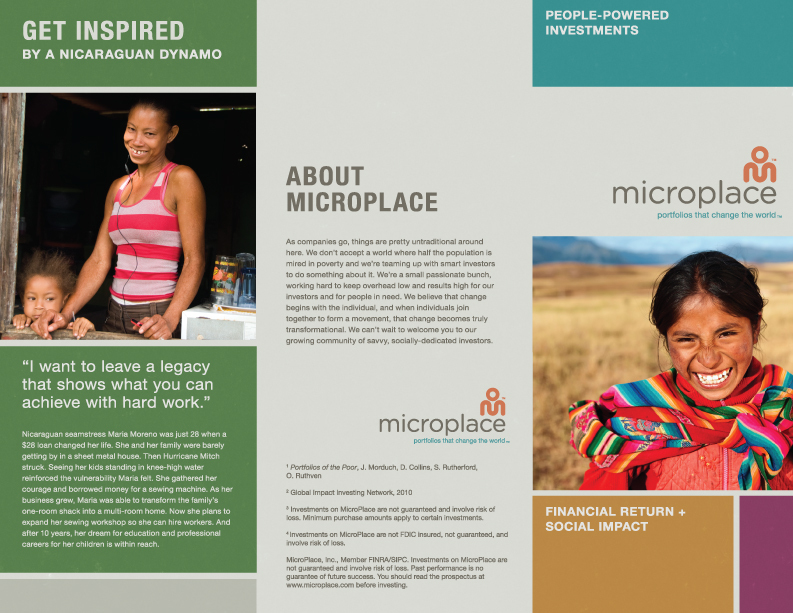 MicroPlace makes it possible for you to earn a financial return and do good at the same time. We scout out impact investment options offered by a carefully selected group of issuers. They fund microfinance loans, fair trade businesses, and other projects that help the world's working poor. Charity has its place. But impact investing is powerful stuff, enabling you to recycle your money and keep growing the good it does. It's expected to reach $500 billion in the next decade—transforming lives and communities worldwide. As companies go, things are pretty untraditional around here. We don't accept a world where half the population is mired in poverty and we're teaming up with smart investors to do something about it. We're a small passionate bunch, working hard to keep overhead low and results high for our investors and for people in need. We believe that change begins with the individual, and when individuals join together to form a movement, that change becomes truly transformational. We can't wait to welcome you to our growing community of savvy, socially dedicated investors.